Are solar panels right for your home? How much can you save on your electricity bill? What are your solar purchasing options? At Solar Optimum, we understand your questions, and we want to help you find the best answers by offering a FREE Solar Savings Report! Solar Optimum has partnered up with PowerScout, a data-driven eCommerce platform for clean energy. PowerScout uses satellite and property data, so Solar Optimum can instantly provide you a FREE solar savings estimate. You can run the numbers yourself by simply entering your address information. So how does it work? The Solar Savings Report offers estimates on how much you can save on your electric bill, which federal tax credits may apply, how many panels you’ll need and how much your home value could increase by going solar. You can customize the report to include your current monthly electric bill amount and electric vehicle usage, if applicable. The report will also include how many trees are saved by avoiding CO2 emissions from fossil fuel energy sources. Because when you go green, you save green! And those are just a few of our Solar Savings Report perks. The report also includes a side by side comparison of both purchase options buying versus financing with a breakdown of your average savings by month, year and over the span of 25 years. This comprehensive overview will help you decide which option works best for you and your home. Last, but not least, a geo-map will display how many neighbors in your area have already gone solar. Let us show you how getting powered by Solar Optimum is a breeze! Click here to use the all-new Solar Savings Report. 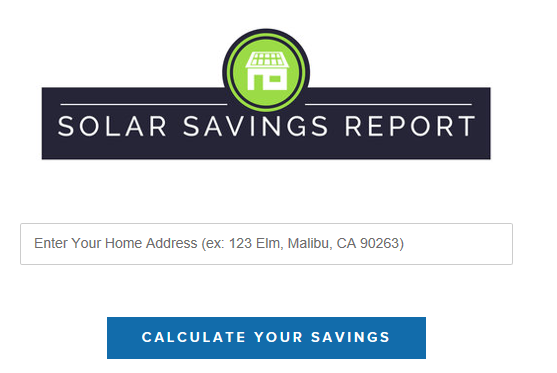 Simply type in your address info and receive your FREE solar savings report, no strings attached. At Solar Optimum, only the sun can outshine customer satisfaction and we are proud to celebrate our 10 year anniversary with you this year! If you have any questions about our FREE Solar Savings Report, click or call at 818-745-1483.